Sources say the man told his loving wife "Mmm-hmm" four separate times while continuing to read. MILWAUKEE—Local man Todd Bogen, 32, reportedly expressed mild annoyance Saturday, muttering, "Jesus, what it is it now?" in response to being interrupted by an incoming phone call from his wife while trying to read Swamp Thing Vol. 3: The Curse. "For Christ's sake," said Bogen, holding his finger in place in issue 39, where Swamp Thing is decapitated by a humanoid fish monster, before answering the call from the woman he married in 2009. "I do not have time to deal with this crap." 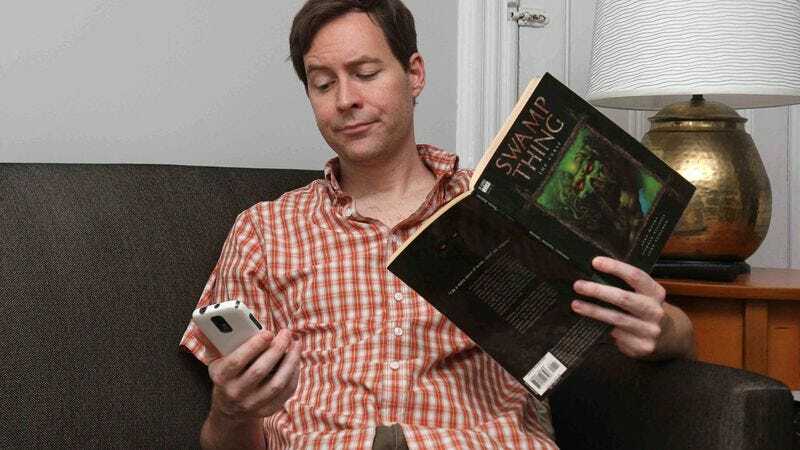 "Ugh, it's always something," added Bogen, who released a long exasperated sigh and shook his head, alternately staring at the cell phone clutched in his hand and the cover of the trade paperback containing issues 35 through 42 of Alan Moore's Swamp Thing run. At approximately 2:30 p.m., sources confirmed, Bogen curtly answered the call from his wife, Stacey, with a terse "What's up?" Speaking brusquely, he then attempted to get through the conversation as quickly as possible in order to continue reading about how Swamp Thing destroyed a sunken town populated by underwater vampires. Although several minutes earlier Bogen had been concentrating on a five-panel sequence in which a vampire captures and noisily consumes a rat, the 32-year-old sharply informed the woman he loves and is committed to spending his life with that he was "a little busy." "What do you need?' Bogen snapped at his wife, eager to revisit artists Stephen Bissette and John Totleben's depiction of Swamp Thing's consciousness spreading into and controlling all of the nearby botanical life. "Make it quick, though. I need to get going." Throughout the brief phone call, Bogen repeatedly said "uh-huh" as he scanned the story that showed Swamp Thing ripping gigantic, finger-like roots from the earth and causing the lake to empty out and wash away the vampires in a rush of water. "Yes, I am listening," added Bogen, focusing entirely on Alan Moore's prose, which switched the point of view to the pained thoughts of the vampires as the surging water peeled the rotted flesh from their skeletons. "Of course I want to hear about it." "Tell me when you get home," Bogen added. After being asked if he wanted anything from the grocery store, Bogen reportedly skipped ahead in the book to a splash page featuring Swamp Thing kissing Abby Cable and bluntly told his wife, "I don't care, just get whatever," before mentioning that she should pick up some more chips. According to reports, Bogen ended the call by saying, "Yeah, yeah, yeah, okay…I'll talk to you later," closely examining the image of a skeleton entangled in telephone lines, and grunting an affirmation of his love. He then put down the phone and resumed calmly reading the collection of comics he has read at least five times previously. Sources confirmed that later that night Bogen received another call from his wife and pretended he had been sleeping when he had really been watching Firefly on Netflix.